What hopeless situation troubles your heart? The death of a loved one? The memories of childhood abuse? The diagnosis of terminal illness? The strain of financial failure? A stormy marriage? A body wracked by pain? A lonely sense of emptiness? 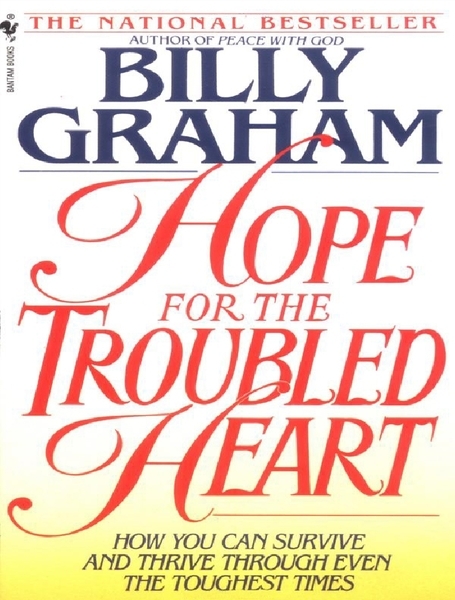 Into your hopeless situation comes beloved evangelist Billy Graham bearing God's gift of hope, one of the strongest "medicines" known to humanity, an amazing resource that "can cure nearly everything." Filled with unforgettable stories of real-life people and irrefutable lessons of biblical wisdom, Hope for the Troubled Heart inspires and encourages you with God's healing and strengthening truths. It shows you how to cope when your heart is breaking, how to pray through your pain, how to avoid the dark pit of resentment and bitterness, and how to be a comforter to others who hurt. You'll be reminded that "before we can grasp any meaning from suffering we must rest in God's unfailing love." And you'll find the "joy to be discovered in the midst of suffering." Here you'll learn how hope helps troubled hearts find peace.